Every time I visit my local craft store, I find myself walking down the aisle with the mason jars and picking up a few. Mason jar crafts for Christmas presents are a fun, inexpensive way to gift something unique. I even picked up some jar accessories on sale this week! Because mason jars now come in so many sizes, it’s very easy to create a gift completely customized to its recipient. I’ve compiled a list of mason jar craft ideas that would be great options to use for Christmas. I hope you enjoy and come up with some fun ideas of your own! A great gift for grandparents, or other family members. 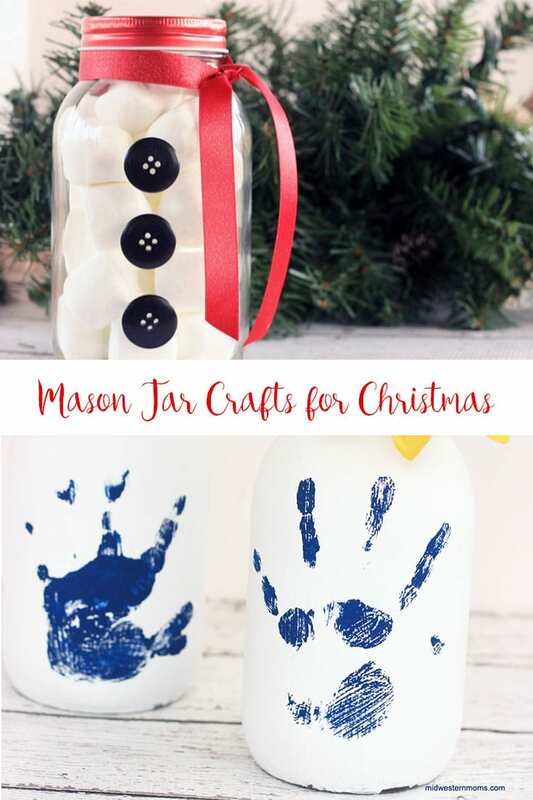 Use your child’s handprint to create a mason jar gift. Our pets often receive presents in our home as well. A great idea for the furry family members. Mason jar painted like a snowman. Would be a great gifting jar, or even used as home decor! Cookies in a jar always make a great gift. Use a gift tag to display the recipe and let the recipient add the wet ingredients and bake! A great idea for young kids! Also a great gift to give to kids if you have a long drive to Christmas dinner. This would be a fun distraction for travel! Here’s one for the adults. A sweet and savory gift for that person who is always hard to buy for, but loves to snack! These are beautiful! Would be a great gift, or fantastic craft to make for your own home decor for Christmastime. Perfect gift for your mom, or best friend. What girl doesn’t love a little pampering? Put together a jar of smaller items she can have some fun with! I struggle thinking of Christmas gifts for my kids’ teachers. This would be a great gift idea for the teachers to fill with pencils, office supplies, or even some motivational quotes. Such a cute idea for the superhero lover in your life. We all need a few extra places to dump loose change, and these are perfect for a little someone who may be saving up! How clever is this? I can think of so many things to include inside a DIY themed jar! Soup mix is always a delicious way to give a gift. This is a wonderful idea for showing your friends how much you care. Homemade granola is simple to make, and looks beautiful in the mason jars. Another delicious Christmas gift idea for your foodie friends and family. What a cute idea for the kiddos! I love how the animals on the lids are painted the same color also. Homemade beauty products in a jar are always a great idea for a female gift. This gingerbread sugar scrub looks awesome, and the site includes a free printable for the label also. Mulling spices in a mason jar packed with other scents to create a Christmas gift that will awaken the senses. What a great idea for people who love the smell of the holidays. A great spouse gift idea–date in a jar. This one is for miniature golf, but think of all the fun ideas that you could come up with! Includes a free printable for the label. This gift is a great idea for the chef in your life. A gift idea I can get behind! Add instant coffee, or even K-Cups, along with some creamer, or even a chocolate spoon favor for a fun and creative gift. Candles in mason jars are fantastic gifts, and can often be customized to different scents. Peppermint sounds like a great Christmas idea. What mason jar crafts for Christmas are you excited to make?